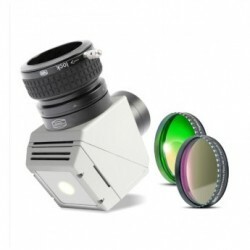 This product (BAD-HERSCH-V) is the Visual version, which is optimized for visual observing of the Sun; for solar astrophotography, order the "P" version. What kinds of telescopes can be used with the Herschel prism? The Herschel Prism is intended for refractor telescopes without field flattener lenses on their rear side! The objective design (Doublet, Triplet, Air-Spaced, etc.) is not important. For all other kinds of telescopes we recommend a standard full-aperture type solar filter.